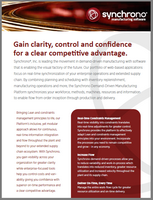 Synchrono InSync services deliver continuous improvements so clients maintain their competitive advantage. In addition to providing first class software maintenance and support, our remote and on-site consultations go above and beyond to ensure that your manufacturing practices are industry best practices. Our approach to demand-driven manufacturing incorporates the most successful principles from Lean, TOC, and Six Sigma. Primary outcomes include effectively managing constraints, improving flow, and driving on-time production. While all InSync Services work towards driving continuous improvement, we also provide assistance in formalizing your CI program and/or supporting your internal CI team with actionable information from your Synchrono system to focus your efforts. Experienced with hundreds of CI initiatives, InSync consultants show you how to add power to your CI program and uncover areas of innovation to increase flow and enhance efficiency. In synchronizing core areas of your operation, your Synchrono system will help you achieve a greater supply chain vision. InSync consultants help create the path towards this vision with a tactical roadmap to operational effectiveness and perfect order performance status. An added layer of support services to keep your operation running smoothly that includes access to 24-hour remote assistance, constraints evaluation, upgrade support, system audits and help in using some of the more advanced system tools. To discuss our service programs or to learn more about Synchrono, contact us today.